On Sunday March 6, it was announced that Zaphara Cazalet, one of the members of the Relay for Life team Strange Journey, had passed away. 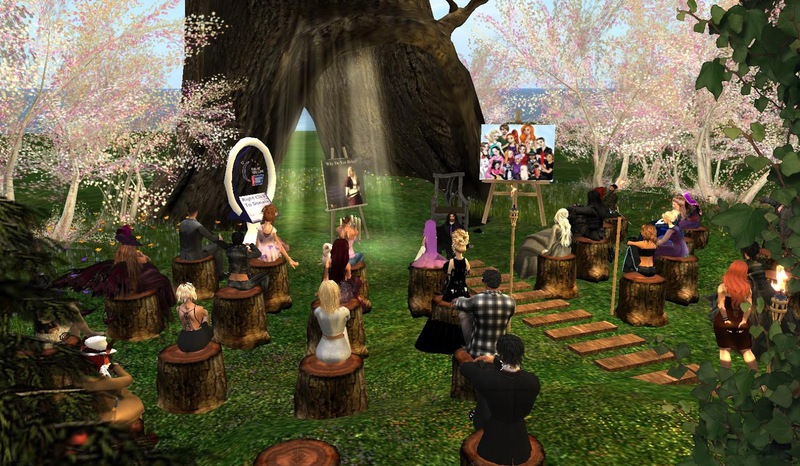 On Friday March 11, fellow Relayers and other friends of hers held a service for her to pay their respects. 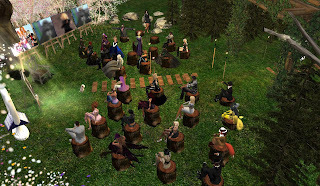 The event was held in Skybeam Hideaway. 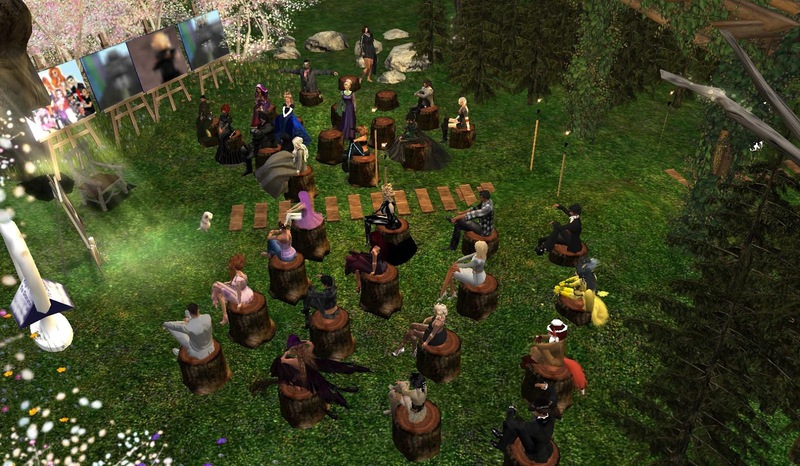 The event began shortly after 1PM SL time, Rowena Dubrovna saying, "Okay, (we) will go ahead and start. For those who just arrived, it will be informal. I will type a few words then we have some poems, and hopefully some of you have poems you will volunteer to read, then we will share memories about Zaphara. Thank you all for coming, Zaphara made a huge impact on me and it is nice to see others who she made an impact on. As you probably know by now this was an unexpected passing and took us all by shock and surprise. "I met Zaphara nearly three years ago, and she was one of my first and strongest supporters of the Castle contest. That's how we created our bond, my love of castles and her love of building. She spent so much time and care into her castles (smile). I really got to know her the second year, talking almost every day. Not too long ago we talked about death. We talked about Riko's passing and how it can be hard, but how we should always smile , laugh and remember the good times. It is almost eerie to me that we had this conversation, but it was so real, and Zaphara was so aware. We talked about how our time is precious together. Zaphara was a true champion of Relay for Life. She was a caregiver herself, up to the day she died, of her father who had cancer. It was deeply personal and she supported us all the way. She was a staunch supporter of one team, one dream, one cause. She joined us last year and we had so much fun. She paused for a moment, "Okay, I am good. I will recover a bit when we share memories. I am too emotional to keep talking about her (nervous chuckle). So my dear friend Nevar has a poem he would like to read. Zaphara loved poetry. That's how we met, actually. She hosted a poetry night that no one showed up to but us -- haha-- and it just took off from there. " She paused again, "Okay Nevar...."
Nevar Lobo then went to in front of those attending, and sat down, "Sorry for sitting here but i think its the only way i can make it through this. I want to thank each of you for being here and just wanted to take a few moments before I read this poem and tell you about my sister. "I have been role playing in Gor since 2006 and after meeting and spending a lot of time role playing with Anjali and Zaph Cazalet, I was formally adopted into the family on January 30th 2009. There was never a day that went by that we did not speak or hug or just shoot each other a Facebook message. Zaph loved me for who I was and she had the most amazing soul. An amazing builder and seamstress in real life as well. She was a very big part of the Texas Renaissance Festival, which was held each year about 50 mile from where she lived. Most importantly, Zaph ... my sister loved life and was the kindest soul. She is sitting looking down on me right now telling me how proud she is and not to make this a sappy affair. "So, I had a poem to read but I was sitting and thinking about what my sister would say to me if we had that one last chance to talk. I saw her online the day before we lost her and I got a hug and an I love you. to cervical cancer and she wrote this song for her husband and children to say good bye. I'm sure this is about what Zaph would have said to me. The birds will make their joyful sounds. But you'll be okay on that first day when I'm gone. You will reach for me in vain. And morning glorious blue skies. And softly smile to your surprise. I will miss her always .. but WE'LL BOTH BE FINE! " Never then looked to the one in the crowd he'd looked at earlier, "Lark? you want to say something?" Lark (discovering.destiny) answered, "Yes, Thank you Uncle." After a moment to compose himself, he spoke to everyone, "As others, I would like to thank you all for gathering here today in remembrance of my Aunt Zaph. She was one of the individuals who motivated me to build here in SL and for that, I will always be thankful. This morning, I was listening to a morning show and heard a lovely song that seems fitting . . . for if anything, Zaph was one who knew how to celebrate the new day. So I would like to share this in her honor. It is a song titled 'Echoes In Rain' by Enya. "Alleluia, Zaph. May you be celebrated with each new day, and may each new day hold beauty for you. As my mother would say, walk in a beauty way." about the days we missed. and one more day to hug to bring strength out of the blue. I would be greedy to ask for one more day to forgive and one more to ask forgiveness. If I had one more day to dance with you and one more day to relay with you. And one more day to build a team and one more day to live our dream. "I guess what I would like to take away from today is I never let one more day pass me up to tell all of you how great you are .. thank you." Rowena asked, "Anyone else have a poem they would like to share?" After a pause in which no one offered one at the moment, she continued, "Probably my favorite thing about Zaphara was her undying loyalty- to me, to her family, to her cause, to what she stood for. There was no messing with her. You can see it in her profile, say something bad about someone she cares for and she will flip on you, haha (smile). I will miss her. We will never forget how much of a contribution she was and how much of a friend and family member she was to us. Sid, Cuddly and I decided that her parcel at the next Castle Contest will remain empty and we will put several things out for you all to put notes about her and pictures." She then turned to Madonna Daehlie, "Madonna wanted to share a few memories, Madonna?" Madonna, the Relayer known for her rubber outfits, spoke up, "Hi everyone. I do have a few thoughts. I do apologize if they come out as word salad. Rowena wanted me to share a poem, but, I'm not much of a poet. So... I'll go with thoughts. "I first met Zaphara back when I was coaching in 2013. She was a new captain, and during my year as a coach, I encountered three types of captains. The ones who wanted to do their own thing. The ones who needed guidance and support. And the ones who just needed a hug from time to time. Zaphara was in the third category. Despite not knowing her for very long, I did see she had an incredible amount of passion for RFL, and wanted to do great things. And, so, I'd do what I could to keep an eye out for her. I'd drop in on her events. I'd check on her. Things of that nature. Plus, she did run some very unique and heartfelt events that I enjoyed quite a bit. "I wish I had gotten to know her better. That's something I find myself saying so much anymore. Because anyone with that kind of passion for a cause like Relay, and that kind of compassion, must be one heck of a person. She certainly was. I know over the last few years, I did enjoy Relaying with her quite a bit - both with her as a captain, and later with TSJ. I enjoyed talking with her the times we did talk. She was not only a great Relayer, but, a great person. The kind that I wish we had more of in this world. "I'm so glad I got to know her, even if it was all too brief. It won't be the same without her. I know I'll miss her. I know I wish I had gotten to know her better. I know that's something I need to do more of from now on. We'll all miss you, Zaphara. Thank you for touching our lives." Nevar spoke again, "I do want to say one more thing that the Goreans who knew her would totally understand .... Zaph was for ever keeping her bow skills up and it seemed that every time I came into Teletus I had to watch my back because there was all ways a message over there estate that would say three words 'RABBIT HUNTING TIME.' So I always knew where the hiding places were no matter where I was in the sim . Kept me from getting myself killed. But more often then not she would just shoot me out of spite and there went my meter and I was down! So to you Zaph.... 'IT'S RABBIT HUNTING TIME.' "
Rowena gave a chuckle, then continued, "Here is something that Zaph wrote aobut her castle that really shows you what she was in it for. "Hi I am Zaphara Cazalet. I have named the my build Castle Cazalet. It is constructed in the distant future around 2900. There are 4 levels. The inhabitants love things from the past, thus the decor is from the past. The outer hull consists of solar coating which powers the castle. From within the castle almost all the rooms you can see out over the area. I built with the idea of peace and tranquility in mind. Free of the ravages of our world, meaning for one that cancer no longer exsists. I Relay for the family members and friends I have lost to cancer and those who continue to battle cancer. Rowena spoke again, "Let me say something then ... Most of you here are Relayers. I think, too often, we are faced with the reality that we lose people every day, and sometimes we lose people from our own Relay. We see Zaphara, who fought with us for MANY years, fought for those who are fighting cancer, fought for her own father. I think, I hope, you all realize that we are now tasked with the responsibility to keep on fighting, as that is exactly why Zaphara is into this. We are here to join her in her legacy, to continue what she started, to keep going. Think of Zaphara and her loyalty, her will, her love of people, her love of Relay. If you ever feel down, just think, I am in it for so many reasons. It was already a reason, but it is even more so- we relay for her father, and with that, we Relay for Zaphara." Rowena then reminded, "Oh! There is her castle from last year. Did you guys see the first year castle? Oh it was so unique!" She turned to one of the audience, "Alexia do you remember? It was like.. pathways to nowhere (giggle)." Alexia Hykova answered, "O course I remember." Kaiila added, "I remember it well, but will be nice to see it again." Rowena responded, "Zaphara never gave it to me! She kept saying she would but didn't." Oldesoul Eledemar added, "She was a wonderful builder, but primarily a wonderful person to everyone." Rowena went on, "Thank you all for coming, truly, I know the Cazalet family and Strange family really appreciate it. If you have any more memories we would love to hear it (smile)." Nevar Lobo turned around and looked to someone, " Master Jake , you have anything you would like to say about Zaph?" Jake of Tarnfell (jake.molinaro) answered, "Well, I didn't know her that well. I know Anj and Lark, but then from time to time in the old days Zaph would IM me with intrecet building question. so instead of typing for hours I would just TP her to my work shop and there she would just sit and watch as I showed her, and gone she was again. I have had a few students, none so well in taking notes at her though." Nevar smiled, "I remember she would tell me 'Jake taught me that.'" A latecomer to the service showed up, Sara Llewellyn (sarandel.llewellyn), "I wish I had been here sooner. But I am here and I offer my prayers for everyone. If you need anyone to talk to, my ear is always open. Rowena mentioned someone else who wasn't there at the moment, a certain sugar glider, "Sidonie wanted to be here today but couldn't. She had many memories of Zaph." She then noticed a name pop up on her viewer, "And ironically there she is. Sidonie last year gave the lauderate speech for Zaph." Noticing a few people standing up, Rowena quipped, "No one leave yet. Sid had a few words, then you can leave. ... Sid had some words for you all- she is coming now." The small sugar glider avatar in sunglasses appeared, slowly rezzing. Rowena spotted her, "Here she is. ... Sid, I know you couldn't come on time, I told them you had a few words and memories on Zaph." After Sid received a few greetings, she responded, "Hallooo Smurflings! ... I apologize... ma real-life work life is a bit crazy these days. ... I am very glad you all could come tonight, because this is about a very special person. I am not going to hold a long speech ... just sharing some of my memories with you. One reason I remember it so well when we met Zaphara for the first time... is because it was the veeeery beginning of our Strange Journey. We were a brand new team. I remember I had this horrible parcel on a horrible sim with no support whatsoever (chuckle). But there was this neat little pond, with some trees around. This is where we met...for our first poetry reading. "I'm not really a poet. When I rhyme it always becomes something about smurfs. But Zaphara, she read some of her poems. And, I remember how it touched me, instantly. she was a very unobtrusive person, polite, and modest. And, although we had never seen each other before, it was like, we had known each other for a long time. There was a bond between us and her, the moment we met. She became a friend. We supported each other. And then, she became more than that. She became family. And like Riko, she will always be, always, our family. She will be horribly missed. I will miss her. Thank you." 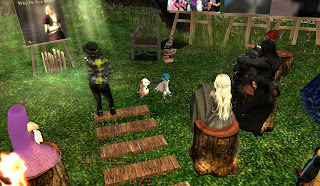 Henrietta Demina, "Many thanks to Rowena, Nevar, Cuddly and Sid for setting this up today." Alexia Hykova, "Thank you Rowena, very nice service." Sienna (sienna.thor), "Lovely Rowena, thank you and all." OldeSoul, "Thank you Team Strange Journeys, and thank you Team Goreans." Rowena acted humble, "I do not deserve thanks, it was all Nevar and Cuddly." Nevar, "Thank you on behalf of Lark, myself and the entrie Cazalet family for loving our sister , mother and friend ! GOD SPEED ZAPH ... WATCH OVER US ANGEL! HUZZAH!!!!" Lucien Wildrose, "I am very sorry for you guys loss. I did not know Zaph well, but I do know Flame well and some of Zaphs family. You guys are in my thoughts and prayers." Dianna Wycliffe-Mousir (dianna.wycliffe), "My thoughts and prayers are with you all." Katerina Amaranth, "My prayers and thoughts are with you of her friends and family as well." Rowena Dubrovna gave her thanks, "Thank you all for coming. I will leave it for quiet reflection. Thank you again for coming. Hugs and love to all of you. By the way, Zaphara is in the Memorial Garden at ACS. The SLURL is: http://maps.secondlife.com/secondlife/American%20Cancer%20Society/40/52/2 . ... Now everyone go Relay, and build, and be silly, and strange. That is what Zaphara would want." Oldesoul added, "And attend events - she felt that was very important!" People began to head out, Katerina saying, "Be well, everyone, and condolences again." Kaiila, "I am going to have to go. It was good seeing everyone, just sad it was for this.. However I am going to celebrate remember and fight back, for Zaph would expect no less." Sara Llewellyn (sarandel.llewellyn), "People ask me 'Why do you Relay?' This..this is why I Relay." And so the audience dispersed, some going to other Relay events to carry on the fight, some lingering to reflect for a while. It was clear this was a person whom would not be soon forgotten. Did you know you can shorten your links with Shortest and make $$$ from every click on your short urls.